This sale is for your choice of one adorable 2-piece, "Hat & Diaper Cover Set" for your precious little ones! These are matching, hand crocheted hats with diaper covers that are custom made to fit around babies little legs without gaps! It also has an adjustable waistband for babies comfort. They are especially sized for reborn and newborn babies sizes: 0 - 3 months. These sets are suitable for a baby boys and baby girls and are soooo soft and comfy. These sets wash up in a snap. Babies just love them! Please specify the color(s) you would prefer at checkout. If you don't specify a color within 24 hours of buying, a neutral one will be sent to you. We are known for our speedy shipping & handling ! * All of our inventory is kept in a non-smoking, pet-free environment. ** We do not accept returns. We do take very special care in packaging, however we cannot be held responsible for items once they have left our care. *** We only accept PayPal, MasterCard. Visa, Discover, Amex. **** Shipping rate shown in listing applies only to the lower 48 states. ***** We will gladly combine shipping costs on multiple purchases, but only when we are contacted prior to payment. 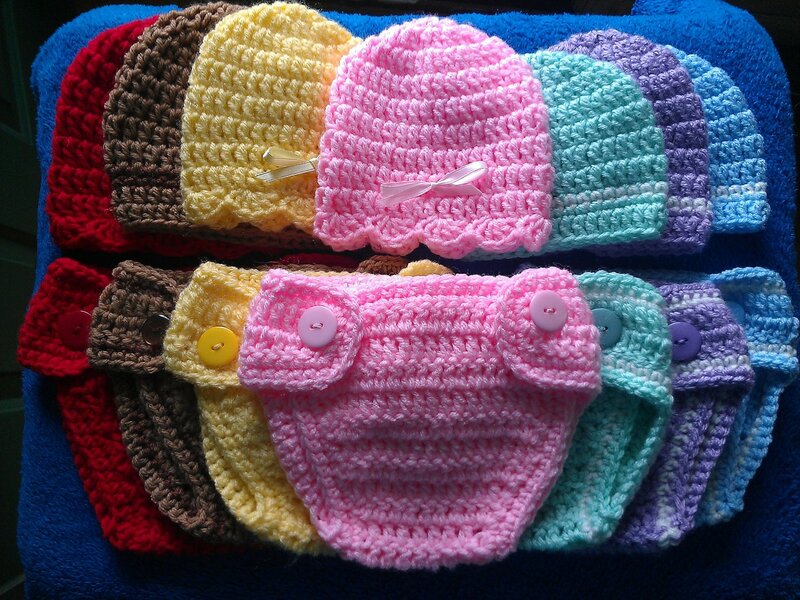 This price is for the "2 Pc Crochet Hat & Diaper Cover Baby Sets" only, it does not include the international shipping & handling costs. Prior to payment please contact us, and we will send you an invoice for the shipping and handling costs. Also, please contact us prior to shipment if you would like insurance coverage, and include the cost when making your payment. *NOTE: Payment is due within 3 days after purchase.